“The problem we all live with” is an iconic image of the Civil Rights Movement in the USA. It depicts Ruby Bridges. She was the first African-American child to attend the all-white William Frantz Elementary School in Louisiana during the New Orleans school desegregation crisis in 1960. I framed the procedure as a viewing/describing activity towards collaboratively building a story with prompts. For the prompts I used the typical journalistic questions: Who? What? Where? How? Why? Where do you think she was going? The students were speaking, they listened to their classmates’ ideas and took notes. 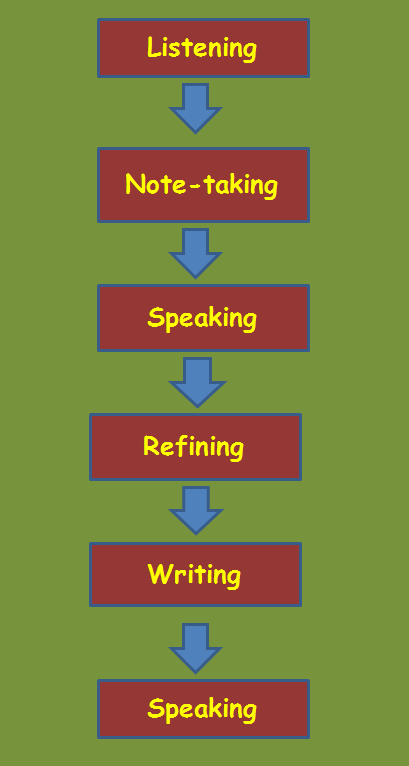 As the story was gradually built, individual students narrated it, adding each time the new elements, so that they could get an as good as possible grasp of it. They came up with descriptive pieces of writing based on their notes and class discussion. Students were very happy with Ruby’s story. They liked the painting and they also liked this beautiful little black girl. They thought that the four policemen were walking with Ruby and protecting her because she was an important person. They made associations with the former USA president. Look carefully, what more can we find? Why do you think that people were reacting like that? It came very natural to children to say that this had happened because she wasn’t white, she was different. I then provided them with the geographical and historical context of the incident. We also moved from racial intolerance in general to the racism of our everyday life. I asked them to look at each other and notice how different we are, whether that means height, weight, whether we are strong or less strong, and the things we like. We are all different. It was about raising awareness of intolerance towards difference: the more “different” the other is perceived, the stronger the fears and negative feelings tend to be. Interactive video (hotspots with questions and information): Ruby Bridges talks about herself and the painting. Work in groups of 3. One of you must get in the shoes of Ruby, one in the shoes of a US Marshal, and one in the shoes of one of the people in the crowd. From your point of view, answer the questions: What do you think? How do you feel? What do you care about? 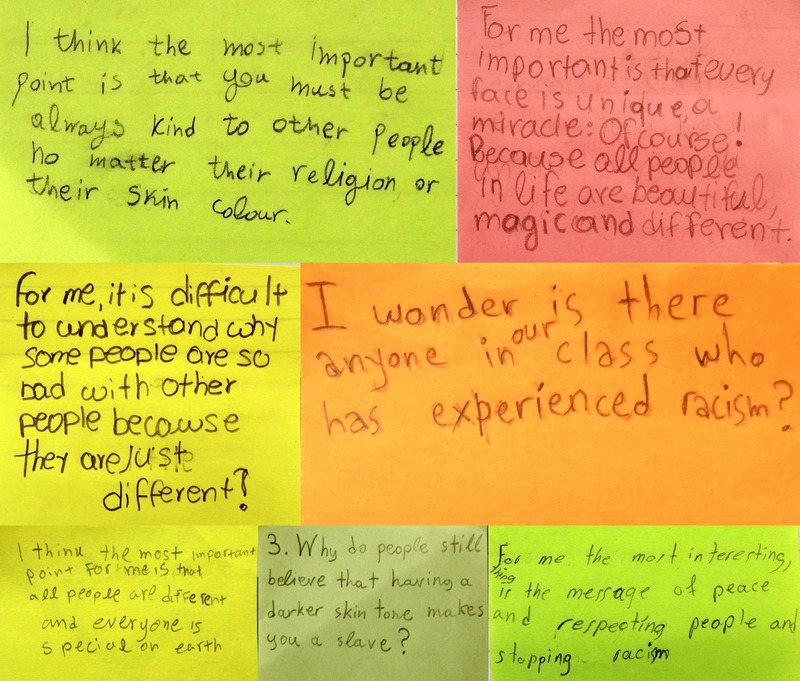 These questions build understanding of multiple perspectives. Watch the trailer from a film about Ruby Bridges. Answer the questions: How is the trailer similar to the painting? How is it different? How do you feel? Why? What new things did you learn about Ruby’s story? Visit GoogleEarth – Louisiana (make sure you open your browser in Google Chrome). Prepare a word doc or a ppt presentation about 3 things that you find interesting about Louisiana. Prepare a word doc or a ppt presentation about Norman Rockwell. Ruby’s story triggered students’ curiosity and evoked self-initiated work and further research. They made little booklets with illustrations, handmade word clouds, little posters. I think what happened to Ruby spoke highly to children’s hearts and minds. The interactive work was created using H5P, an online tool for creating, sharing and reusing interactive HTML5 content. The 21st of March is the International Day for the Elimination of Racial Discrimination. 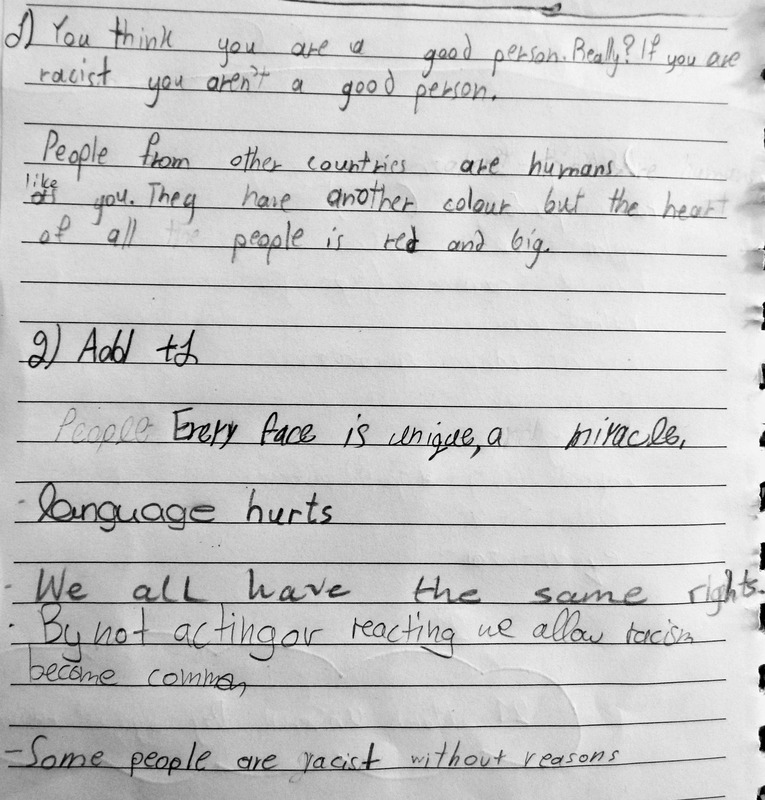 We worked with eleven-year-old primary school students on the topic of racism, not only on that day, but also during the following week. Here is an account focusing on two of the resources we used and the activities we worked on. I described this in the previous post. It is a thinking routine that provides learners with a structure for identifying key ideas and committing them to memory. It can be used after reading a text, watching a movie, or being presented with new information or ideas. Students are asked to a) recall and note (a list of key ideas), b) exchange notes with classmates, read others’ ideas and add one new thing to the list, and c) review their returned notes with all the additions from their classmates and maybe add any new ideas they have picked up from reading others’ notes. The way we tried it in class was slightly adapted since recalling from memory would be difficult for the students’ language level. I let them have a look at the excerpt whenever they felt they needed to. Make note is a routine that enhances students’ memory of and engagement with ideas by focusing on capturing the heart and distilling key issues and questions. What is the most important point? What do you find difficult to understand? What question would you most like to discuss? What is something you found intesting? This painting by the painter and photographer Godfrey Rubens portrays the massacre in the town of Sharpeville, South Africa, which took place on the 21st of March, 1960. The incident in which 69 unarmed black African people were shot dead during a peaceful protest against apartheid’s pass-books system marked a turning point. It is the reason that today this day is commemorated as the Universal Day for the Elimination of Racial Discrimination. We first worked with the see, think, wonder routine. The children wrote and shared interesting ideas and thoughts and were very curious to know what, where, and why this happened. This high curiosity level led us to look at the historical facts behind the painting. I wanted to avoid developing another reading text since we had already worked with the excerpt from Tahar Ben Jelloun’s book. I decided to frame it as a listening activity. I started telling the story using simplified language to ensure understanding. At the same time I was writing key points on the board. Students were listening and taking notes. From time to time I asked them questions or invited them to ask me questions. I also paused regularly and asked individual students to repeat the story so far. Little by little we built a diagram with the story behind the painting on the board. When we finished that session I asked them to study the diagram at home and be prepared to talk about it next time. In the lesson that followed children practised speaking about the incident by drawing on the diagram. We tried this a few times, students took turns among them each narrating a part of the story and then another would take up and continue. Their confidence gradually grew. During this stage, we added two more clouds to the diagram. In the first one we included the verbs they used (base form) while in the second some other words and phrases they needed to refine their story-telling. The final diagram served as their blueprint for stepping into writing the story. We started that in class and they finalized it at home. Although it was one of the longest texts the children have written so far, it wo rked really well. I asked them in the following lesson how they coped with writing the story and they said that having the diagram with the key points, verbs and extra words was very helpful. Some of them also said that having talked about it in class made writing easy because they “had it in their minds”. We spent a small part of that session narrating the incident again and after having told, retold and writing about it there was a very satisfying, smooth speaking flow. 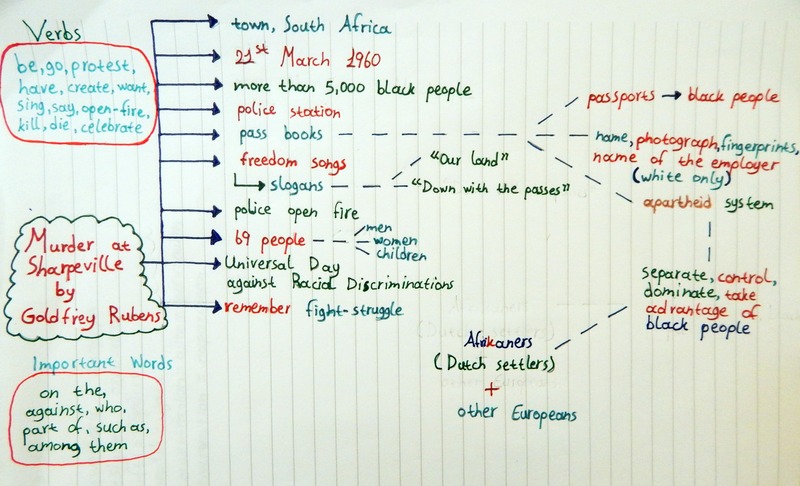 I remember that when we started working on this topic, I had asked students if they knew what we celebrate on the 21st of March. They had come up with the answer: the world day of sleep. It did not come as a surprise. After all, World Sleep Day was quite prominent on tv those days, and I myself had seen a surge of tv commercials for furniture, mattresses and other relevant products. The children had probably seen them, too. I think it’s good that they now know it is the day against racial discrimination. Can you find a title? Tell your students that the title of the painting is Blue Butterflies Tongue. 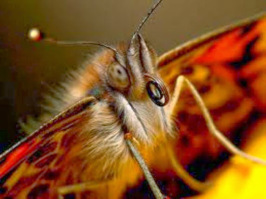 Then, show them the photo and ask them if they would ever think of drawing a butterfly’s tongue like this. Explain that what they see is a work of art by an artist who has Asperger syndrome, a form of autism. Write on the board: If we want to accept and embrace any person within the autism spectrum we have to think out of the box. Have your students express their opinion about what the idiom think out of the box means (think freely, creatively, imaginatively, unusually). Ask them if they agree with the statement. Tell your students that they’re going to watch a short video about Asperger with the title Q & A, which is based on an interview. Ask them to predict who will be the interviewer and who the interviewee. Allow 5 minutes and then show the video once. Let students compare their predictions. Then, ask them how the video made them feel. Let your students in the same groups and tell them that they’re going to watch the video again and that they can ask you to stop it at any point and discuss vocabulary or expressions. Show the video. Ask groups a) to discuss the statements in the worksheet and decide whether they’re true or false and b) write as many sentences as they can using may + infinitive to describe Aspergers. Help them with vocabulary. Allow 20 minutes for the groups to complete the activities and get feedback. Show the autism awareness posters and quotes and ask them to discuss them in small groups. 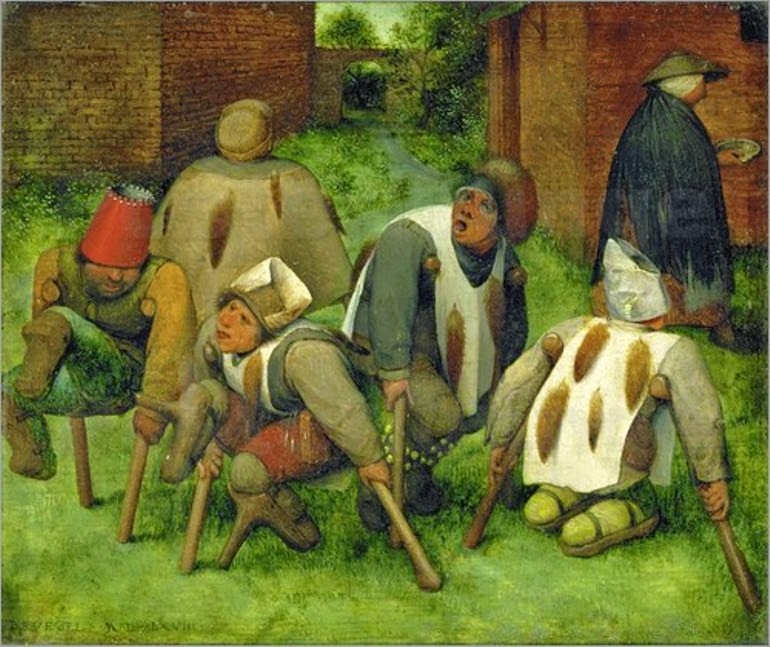 Description: This proposal is organized around the theme of disability related to mobility issues through the use of Pieter Bruegel the Elder’s painting The Beggars (The Cripples), a short video by Claire Cunningham, a multi-disciplinary performer and choreographer based in Glasgow, and a short animation from the Scottish Human Rights Commission and the Equality and Human Rights Commission Scotland. The thinking routines used are Compass Points, and Headlines. Brainstorm your students around what they can or can’t do. Conclude that for each one of us there are things we can and things we can’t do. Show your students the picture below and ask them what they think the woman in the picture can or can’t do. Keep a visible record of students’ answers. Tell your students that her name is Claire Cunningham, and she’s a multi-disciplinary performer and choreographer whose work is initially rooted in the use of crutches. Through them she explores the potentiality of her specific physicality as a disabled individual, and aims to challenge conventions around classical aesthetic and dance. Tell them that they are going to watch a relevant video. Show the video. Work as a whole class. Draw a compass in the centre of the board or on a construction paper and mark E, W, N, S.
What excites you about this idea? What do you find worrisome about this idea? What else do you need to know or find out about this idea? What is your current stance or opinion on the idea? Keep a visible record of students’ responses in the appropriate direction: E, W, N, or S. Students’ responses are recorded for the entire class to see so that they are enabled to build on each other’s ideas. What have the picture and the painting got in common? Show them the slide and ask them to match key words about disability with their definitions. Organize your students in groups. Hand out the worksheet and ask them to classify the words in two groups: words that reflect dignity and a positive attitude towards disability related to mobility issues vs. words that are hurtful or offensive. Go round the class and help with vocabulary if needed or advise students to look up unknown words in the dictionary. Allow 20 minutes and get feedback. Write on the board: Stereotype. Explain to your students that it is grouping individuals together and having thoughts, beliefs or judgements about them without knowing them. It is the product of ignorance or unfamiliarity. Explain that stereotyping is not only hurtful, it is also wrong. Tell your students that they are going to have a look at some slides involving both stereotypical and right ways to think about people with a mobility disability. Show your students the slides below. Pause at each slide and discuss which case it falls into. Ask individual students to read the statements in the slides. What problems might persons with disability face? Tell your students that they are going to watch a short animation video from the Scottish Human Rights Commission and the Equality and Human Rights Commission Scotland on the UN Convention on the Rights of Persons with Disabilities. Show the video. Hold a plenary discussion on the rights of disabled persons mentioned in the video. The right to…choose support for independent living/work/equal access and participation to education/be free from violence/have their voice heard/access sport, culture and leisure /decide where to live/who to be in a relationship with/who to live with/have access to information. Discuss the idea that disabilities are in society and in a lack of accessibility, rather than in the individuals themselves. Ask students: If you were to write a headline for this topic or issue that captured the most important aspect that should be remembered, what would that headline be? 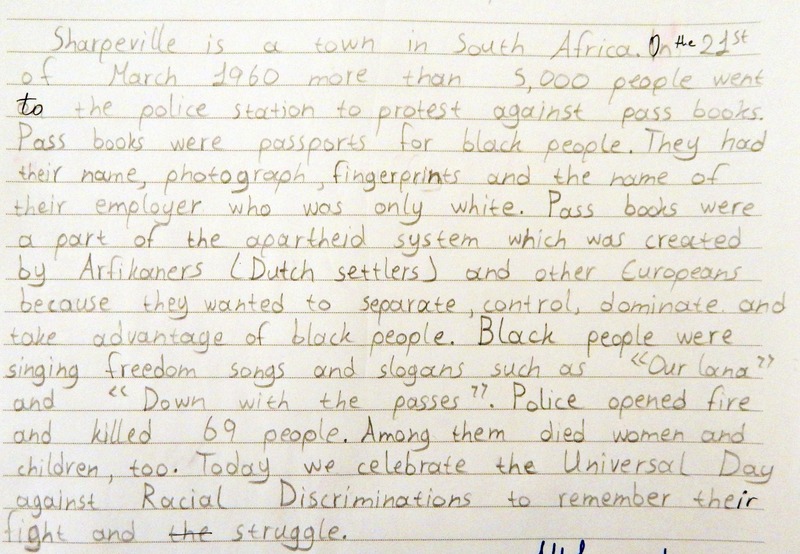 Let students expand on it creatively or by writing a newspaper article on the theme. I hope you will find this proposal worth experimenting with.